Just after I updated my blog with an Etsy treasury which included my hedgehog necklace! I managed to snag a treasury of my own!! :D Hurray! What should I do.. what should I do... I know! In view of my latest necklace, I decided to do a fairytale theme treasury. Can you guess what are the fairy tales that are featured in my treasury? From the above, here are some of my favorites. These bowls look so yummy to hold my porridge. 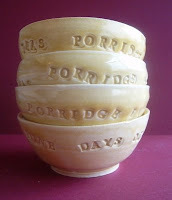 I love the imprinted letters and make them fun to look at while eating my porridge. 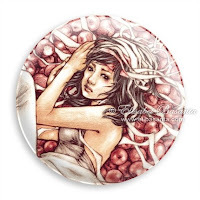 This is a beautiful and different interpretation of Snow White. Whenever people think of Snow White, they would naturally think of the Disney version where there is short hair lady with fair skin, wears a red ribbon headband and has a dress that's blue, red and yellow. This version is more delicate and vulnerable. Little Red Riding Hood Necklace - by Me! I love the picture of the big bad wolf! Those are awesome! Great treasury and a cool theme. I also like that version of Snow White. She's very dainty. The red riding hood necklace is so cute! Nice treasury idea!!! Gorgeous and fun treasury! I love the red riding hood necklace! Very nice - your little red ridng hood is beautiful. Very pretty blog! I love several of your featured Treasuries! Aloha! 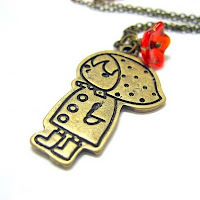 Oh, Red Riding Hood charm necklace is so cute! I would've bought like a million of those if I came across that pendant in a bead store! Your fairy tale treasury is a sweet idea!